AE modular is a quite nice platform for every DIYer, either if you do analog electronics or you are working with microcontrollers like Arduino / Atmel, ARM etc. The whole system is working entirely on 5V, the common voltage used in many DIY projects and directly compatible with usual microcontrollers. All modules are connected with a 10-pin ribbon cable that runs below the modules. Each module is plugged onto this bus cable with a 10-pin connector. 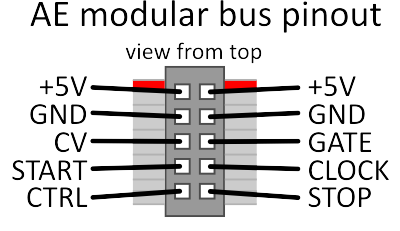 I you want to use this bus for own modules, you find the pin setting below. The red strip marks the +5V side (on two pins); the next 2 pins are ground (GND), the remaining 6 pins are CV/GATE, START/STOP/CLOCK and CTRL (MIDI controller #20) usually fed by the MASTER module. CV signals are also in the range of 0...5V; inputs as well as outputs. Audio signals are usually "centered" to +2.5V, the typical audio level is 3V overall (so the audio swings between +1V and +4V). Some outputs like pulsewaves on the oscillator modules use the full range of 0-5V. Gate/trigger signals are 5V positive. The output resistance is usually 1k. So nothing bad happens if an output is connected to ground or two outputs are directly connected (in fact, they will be summed / mixed).